We live in a sonic environment which is not easily notated on staff paper. 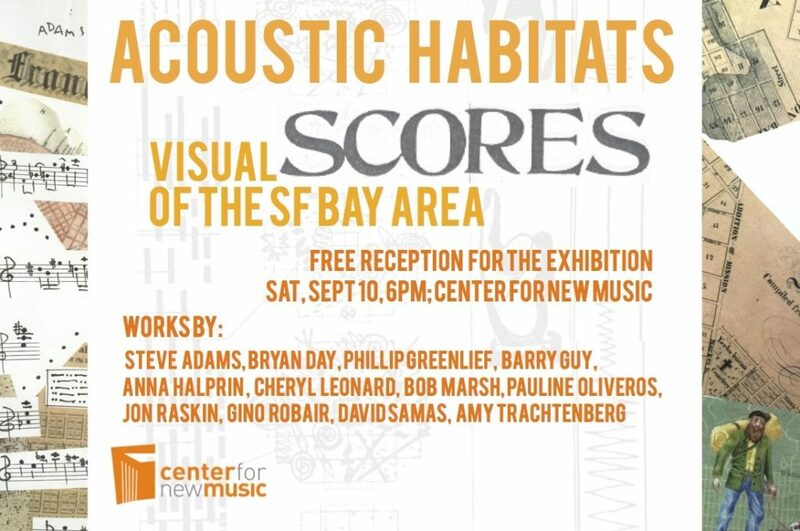 In this exhibit we explore graphic scores from living Bay Area artists whose work reflects a sensitivity to this place and a deeper conversation with the local social, spiritual and environmental landscapes. As a result of the interdisciplinary skill and creativity of contemporary performing artists, graphic notation and visual score-making have become prevalent both in new music and dance. Many composers have become less fixated with expectations of what sounds/actions are made and more concern themselves with how or why actions/sounds are made. Often these composers and performers come from a strong background in free improvisation. Coded within the visual information, more or less subjectively, are the symbols that the dancer/musician must re-express into space and time as music and movement. To navigate this novel realm requires a map that is often site specific; often games or strategies are employed to create this self composing material and ultimately, these artists compose their own acoustic habitats.